Health is one of the MOST important elements of a PIVOT. And, it is one of the MOST neglected. I’m excited to introduce you to Eric Edmeades, someone from whose research, philosophy, and mission I’ve personally benefited. 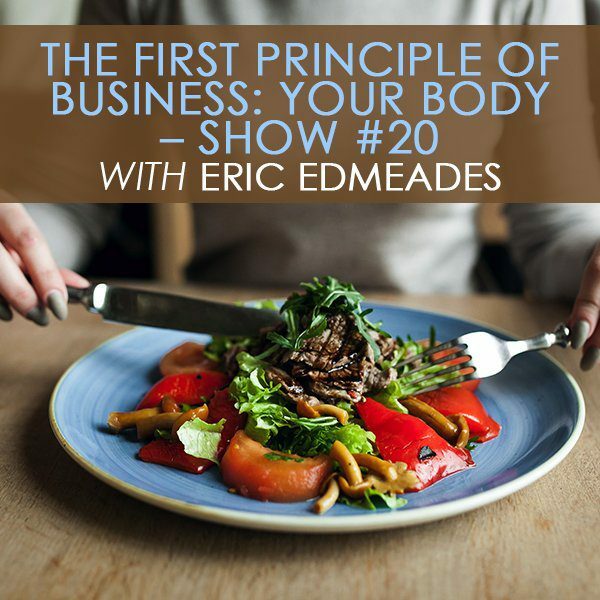 Eric and I discuss the “first principle of business”: Getting your body right, what it takes to really make that happen, and the impact of, in Eric’s own terms, a medical education system that doesn’t focus at all on food and a food manufacturing system that doesn’t focus on health. 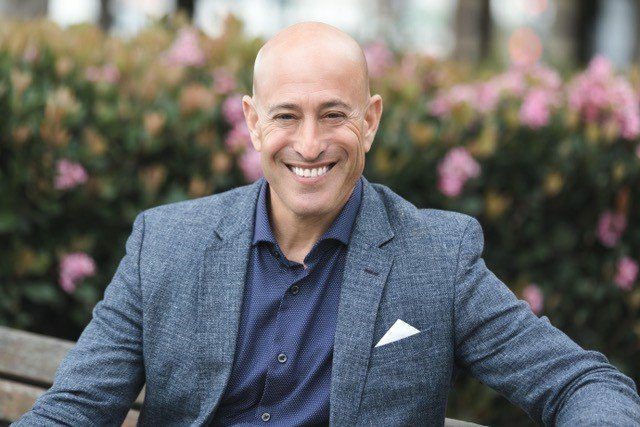 Eric credits his incredibly eclectic business successes to his own major health pivot in his early 20’s and a later recognition that changed his life forever and fostered his mission to bring great health to so many others. Eric Edmeades is an internationally recognized business speaker, film producer and serial entrepreneur. Eric’s varied business background includes mobile computing, medical simulation, augmented reality gaming, 3D camera engineering and Hollywood special effects. Eric is also the founder of WildFit and the creator of both Inception Marketing™ and Business Freedom™ — a business ownership methodology that empowers you to own a business that doesn’t own you. You can learn more about Eric at www.ericedmeades.com. I am more than thrilled and honored to be with somebody that is making a huge, huge difference in the world. Frankly at the moment, I can just say he’s made a huge difference in my life and in my wife, Randi’s life, and a lot of people that I know in an area that I think is neglected more than almost anything. I think there are two areas in the personal development space that are neglected. One is our relationships and anything to do with relationships. I think people always say, “I’m going to work on my relationship as soon as I get my money straight, as soon as I get my business straight.” That’s a shame, but that’s not what we’re here to talk about. It’s the other one which is health, which is taking care of yourself. Quite honestly, if you don’t have your health, you have nothing. It doesn’t matter how much money you have. It doesn’t matter how much influence you have or anything else that you might value, your significance. Nothing will matter if you don’t feel good. I’ve known some folks that have had chronic issues, pain, and illness and things. There’s just nothing that is tougher to deal with when your health is not the way it can be. I learned a few things that have changed my life. Many of you who have seen me either on stage or in Zooms and things where I’m holding up a glass of green drink. I’ve given the recipe that we’ve been using to a number of you as well. This AlkaGizer drink that we start the mornings with. I’ve mentioned this gentleman’s name and I mentioned a program called WildFit, but I’ve never had Eric, who I’m about to introduce you to, on our show to talk exactly about why it is that he got involved in this and made a big pivot in his own life and had some health issues and has had significant success in business. He knows that at the end of it, but I think he can speak to the fact that money and success won’t mean a whole lot when you can’t be pain-free and be in a healthy place where you can have the energy and be able to show up for people. This gentleman is somebody we absolutely love. His name is Eric Edmeades. I think best that he share a little bit about his own pivot experience and what he’s up to in the world these days. Eric, thank you so much for being with us. Your mind doesn’t work optimally if your body isn’t right. That is the first principle of business, get your body right. Your mind does not work optimally if your body isn’t right. You don’t have optimal amounts of energy if your body isn’t right, so get your body right. Where I’ve been lucky is in a strange little feedback loop where because of the major pivot in my health in my early twenties, I have had a phenomenal amount of energy and a phenomenal capacity to take on projects and have had really interesting business life. After selling that business and speaking for a couple of years around the world, I ended up buying a movie studio in California that was the original heart of Industrial Light &Magic. We were doing movies like Avatar and Pirates of the Caribbean. Then we invented a new technology around doing medical simulation that completely changed that industry. I’ve had this eclectic business background, but what I’m really clear about is that would not be true if I didn’t have the energy to do what I do. I don’t do jetlag. I fly to a country. I’m in a meeting two hours after I get off the phone. Why? Because I have energy. The short version of how that happened is that in 1991 I was sick. I wasn’t so sick that I was dying, I just wasn’t living. I had pervasive sinus infection, it’s horrible. I had throat infection so severe that if you looked in my throat, it would have horrified you because my tonsils were bleeding. I had stomach pains that were so bad that when they happened I couldn’t think. Adam, it’s like you get to this place, at least I did, and I’m not sure if you’ve ever had a flu or something where you’ve been sick for long enough that you stop thinking you’re this sick and it’s just the way things are. It was chronic. I’m talking years and years. I’ve been to doctors and specialists and more doctors and more specialists, and they’ve prescribed creams and nasal sprays and pills and liquids and injections, and eventually surgery. None of those things worked for me. Until one day a friend of mine sat me down and had a serious conversation with me about food. I didn’t see myself as somebody who ate particularly badly. I wasn’t vastly overweight. I just needed to make some changes. 30 days later, I’d lost 35 pounds. All of my symptoms were gone, symptoms that no pills, no drugs had ever been able to do much about. What that activated in me is a powerful and driving curiosity as to how it was the doctors weren’t able to create that result for me. One day idly, I’m not even sure what prompted me to ask this question, but I was talking to a doctor and I just idly asked this question, “How long did you go to medical school?” The answer was six years, eight years. I said, “In that six, eight years, how much time was devoted to studying food?” The doctor said something that surprised me to no end, but the answer was none. I then started asking every doctor I could meet this question. In fact, I remember asking my uncle who is an orthopedic surgeon and a well-known, well-renowned orthopedic surgeon with whatever ten or twelve years of medical school under his belt. I sat at the dinner table with him in Plettenberg Bay, South Africa, and I said to him, “In all those years of medical school, how much time did you study food?” He cocked his head to one side like a dog does when it’s confused. No. You might think but instead he had a realization. His response was, “None.” In that instant, he understood how bizarre that was. We have a medical education system that does not focus at all on food, and we have a food manufacturing system that does not focus at all on health, and we wonder why we’re in a lot of trouble. That pivot that I made in 1991 changed my life forever but inspired me to do the same for other people. The funny thing is that I’d been really fortunate that by being successful in business, it’s afforded me a huge amount of time and money to spend on research and travel and really delving deep into this issue. I’ve gone off numerous times to go live with Bushmen in East Africa to get a sense of what our ancestors’ lives were like on a daily basis. I’ve really dug into this stuff really deep. Then I spent a huge amount of time learning about behavioral change and behavioral psychology because the fact is that diet programs don’t work because they rely on will power. As long as the angel and the devil don’t agree, you’re going to eat some of the bad stuff. If you can get the angel and devil to agree, now everything changes. Diets based on will power fail wholesale. You’ve been through all of it. We have a no kidding 80% to 90% success rate which has never been seen before as far as I know in the diet world. One of our clients, that you know, did our program as a partnership with us and ran several hundred people through the program. They did a survey of over a year later, all of our data comes out of people as they’ve done the challenge. This is over a year later and 75% of the people are still reporting on track with the results. That’s brand new in the diet industry. Frankly, it’s the thing that excites me most after my little girl and my family. The thing that excites me most right now is that we are having a measurable solid impact on the health of thousands of people in over twenty countries around the world, and it’s filling now into the medical industry. I’m now being invited to speak at medical schools, at medical councils. It’s just super exciting stuff. As long as the angel and the devil don’t agree, you’re going to eat some of the bad stuff. Eric, I don’t have to look that far which is fortunate for me. I just have to literally look across my kitchen and look at Randi and see what’s been going on with her. She’s always been healthy, not an issue there, but now she’s healthier. Our bodies change. I don’t know if you’re tracking this, but I’m tracking so many people these days talking about how quickly time is flying and I say it a lot. I’m just reframing it in my own mind that time is moving at a perfect pace. As I see changes in my own body and I see them in Randi, having a ritual that’s part of our pivot processes that we create master habits that sustain us, that create the capacity to be more resilient in a more disruptive environment and, at the same time, a more opportunistic environment in business and in life. There are more opportunities than ever been before. We’ve got to be much more adept to seize those opportunities, be resilient for all the other changes that are happening constantly. The politics of our country, the politics here in North America and elsewhere in the world are daunting. There’s a lot of misinformation. There’s a lot of sabotage that’s going on through social media where misinformation is perpetuated. There’s propaganda. We don’t have to digress down that road, but it’s important. For me, that part of what drives me to want to speak with you and share this information is the fundamental health question or the fundamental importance of us taking care of ourselves so that we actually can maximize the opportunity we have to be an influence in the world for good. We can’t do that when we’re sick. We can’t do that when we’re distracted, when we’re going, “My aching back. I’m carrying around weight I can’t get rid of,” or diabetes or any of the things that are caused by poor health and a poor understanding of our health. My dad long ago said to me, these weren’t his words but I think he was passing on the words of Michio Kushi when he was studying with him at the time and he was on macrobiotic diet at the time. He said, “Food is medicine.” I’ve never forgotten that, that food is medicine. Instead of taking or popping pills unnecessarily or doing a number of other things that are prescribed by doctors to deal with your body and deal with things that are coming up in our health, you could focus on what it is that you ingest, on what do you drink and what do you eat. That’s when I heard you speak at a TLC meeting, a Transformational Leadership Council meeting, and I said, “This is a guy I want to get to know.” We took that program that you’ve been alluding to, this WildFit program which has changed a lot of people’s lives. I was in a small group of maybe 30 folks and we supported each other over 90 days. I watched Randi not so much lose pounds, even though that happened as well, I saw her lose inches on her waist, her eyes were clear, her skin was more supple, she had more energy. I felt the same way. Now I’ve traveled all over the word with this green drink in my hand saying this is remarkable stuff, and it’s not just that. Maybe why don’t we do this, dive into a little bit about what you’ve been helping people with? Not so much the program, but what is the “diet”? What’s the change that we go through in 90 days? What does it mean to get back to spring, to go into spring? What’s that all about? Is this a Paleo? That’s what people ask me, “Is this a Paleo thing? Is it a vegan thing?” What is it? If you could put some distinctions around that, that would be great. WildFit lies at this intersection between what we would call nutritional anthropology and behavioral change psychology. With nutritional anthropology, there could be some comparison to Paleo. What we’re doing is we’re saying that every species on Earth evolves an ideal or optimal diet. That means that they evolve the production capacity and the dependency upon certain organic materials. One of the things I would say is yes, let food be thy medicine. Let it be thy preventative medicine. The one problem with that quote, which I do love, is that it creates this idea that you can treat disease with food. Medicine is something we think of as an after-the-fact. One of the examples that I would use is that if we took a person and put them on the perfect human diet. The word diet is funny. We use the word diet as temporary alteration to fit into some outfit for a special occasion. For every other species, diet means way of life. If we were to take a human and put them on a perfect human diet and eliminate all toxicity and all preservatives and all garbage, they only get the perfect stuff but we scientifically remove the vitamin C from their food, they would get sick and they would die without having eaten a single bad thing. There’s so much focus in the diet world about eliminating the bad things. Frankly, the body has a huge tolerance for bad things as long as it’s getting enough of the good things. What I’m really getting at is that our health is determined by getting our needs met. If we are getting our needs met, the body has a tremendous tolerance for the bad stuff. We all know alcohol is not ideal. There are articles out there that go, “Red wine is good for you.” It’s not. You can’t live on this stuff, we’re clear about that. Here’s the beauty though. The beauty is that if your body is well nourished and it is fit and it is healthy, then it has the capacity to deal with the occasional digression. The whole diet industry is predicated on this focus on eliminating the bad stuff when the diet industry should actually be focused on getting enough of the good stuff. Then the question becomes what is the good stuff? The good stuff is anything that we evolved a dependency upon and an ability to process. People are always giving you lists of nutrients, “This super food here has all these anti-oxidants and nutrients.” Fine, but if we didn’t evolve a dependency upon it, it’s not a super food, is it? My desk is made out of wood. It’s full of riboflavin and all kinds of other great stuff, but as I’m not a termite or a beaver, I can’t eat it. It doesn’t matter what its nutritional constituents are. What we have to do is get enough of the right stuff, and then now we come to what you’re talking are better in seasons; one of the major flaws in the diet world right now. We’ve been talking about seasons for years and now I see it popping up in some diets where you’ve got to eat seasonally, but they misunderstand. It’s not that you need to eat seasonally relative to where you live. If you’re in Minnesota in December, you’re not supposed to eat snow angels. What I mean by seasonally is recognizing that humans evolved with cyclical eating patterns. That means that there were times when one thing was abundant and another thing was scarce, and then another seasonal change would come where something else have become abundant and something else have become scarce. In other words, the idea of a recommended daily allowance is insane. First Principle of Business: The only thing that there should be a recommended daily allowance for is air and water, otherwise there’s no recommendation. The only thing that there should be a recommended daily allowance for is air and water, otherwise, there’s no recommendation. There’s no daily amount of protein you need. There’s no daily amount of vitamin C you need. There’s no daily amount of B12 or B6. There’s no daily amount of anything other than air and water. Your body has a capacity to store stuff. Now, we’ve got to look at seasons. This argument around what we’re supposed to be eating is extremely important and really valuable, but irrelevant if we don’t then add the other part which is the behavioral change. The food industry is spending quite literally billions of dollars optimizing their profitability, producing food that are nutritionally empty so that you’re still hungry after you eat them, marketing in a way that takes away your freedom of choice. Adam, I’m not a religious guy but I did go to an Anglican school. In that Anglican school, I remember the story of Jesus’ birth. In the story of Jesus’ birth, they talked about the three wise men bringing frankincense, myrrh and gold, not ice cream and candy canes and pumpkin pie. How did those things become Christmas? Then at the end of Jesus’ life, I remember there being a discussion about bread and fish and wine, but I don’t remember ever chocolate being discussed. How did chocolate get in Easter? But they bought it. The chocolate industry sponsored Easter and they paid for it, and to this day there are people who barely eat chocolate through the calendar year but come Easter, they slam themselves with chocolate because they don’t really have a choice. What we have done is taken these two very powerful things, nutritional anthropology and behavioral change psychology, and married them together in a way where we’re facilitating lifestyle change for people, not putting them on a diet. Can we get into a little bit of the details of that, what that looks like? I have a suggestion. One of the most powerful things for people to take something in the way of real tangible power right now that could actually begin to make some really interesting observations and changes is to learn about the six core hungers that drive human eating. There are six primary reasons that people eat. When you understand those reasons, you gain some control. This moved me. I remember when I heard this for the first time, I thought to myself, “Am I hungry or am I thirsty?” Could you start there? You mentioned thirst. That’s a really fascinating one because for most of our history, we didn’t have pottery. We all walk around with our water bottles now. We didn’t have pottery so that meant that we would drink when water was around. A lot of the hydration that we got came from eating foods that were high in water content. In fact to this day, there are antelopes in Africa that don’t drink ever. They get all of their water from their food. We did drink but we got a lot of our water from the food we ate, and so the body sometimes gets dehydrated and then it sends a signal, “Eat something.” This signal doesn’t work anymore because, of course, most of us eat food that have very little water in it at all. The trouble is that’s in our instincts. Our system was built this way. Somebody gets a little dehydrated and the body just sends up a signal, “Eat something. Eat something.” Of course sadly, a lot of people would turn to a bag of chips at that point which has less than no water in it and a lot of salt which stimulates more hunger and more thirst, and now eats more. That’s why it’s never just one chip. A lot of times, people can actually do a great service to themselves by just focusing on staying hydrated by drinking enough water in the day and then noticing that their hunger goes down as a result of their water intake. In fact of all the six hungers, there’s only one that’s actually truly a legitimate hunger, and that’s nutritional hunger. Nutritional hunger is your body requiring specific nutrients. Because we didn’t have grocery stores for most of our history, we simply ate what was environmentally and seasonally available to us. That meant that when we had a nutritional deficiency, it wasn’t so functional for the body to go, “Go eat this thing,” because that thing might not be available. The body instead basically just says, “You’re low in nutrients. Go and eat something.” That’s it. We have this macro-cravings where you might crave fat or crave salt or crave meat or crave whatever the case may be, sweet, but we don’t have cravings that are specific to our nutrients beyond that. In other words, when somebody is malnourished, they just get this message, “Eat.” Considering that the food industry produces a phenomenal amount of food that has absolutely no nutritional value in it, we wonder why people are over-eating. First Principle of Business: The food industry, in my opinion, is significantly more insidious than the tobacco industry ever was. Adam, this fat shaming thing, it’s got to stop. Anybody who is morbidly obese at this point in time should be considering legal action, not shamed. It is not their fault. I know that there are people out there saying, “It’s their fault. I take care of myself. I eat properly.” Remember that epigenetics and manipulation by the food industry playing upon all of those things has caused the situation now where people literally have no control. We have to do something about that. The food industry, in my opinion, is significantly more insidious than the tobacco industry ever was. One of the ploys they use is to make sure that we don’t get enough nutrition in the food we’re eating so that we need to eat more food. By the way, if you’re a shareholder, if you’re an investor in these companies, this is a great strategy because it’s good for profitability. The other hungers are not real but they feel very real. If you look at empty stomach hunger, your stomach was designed to be empty every now and again. It’s actually really good for it to be empty every now and again. Clean the system out. Your stomach is flexible. Your stomach can shrink right down to the size of your fist and expand right up to a massive balloon for times of plenty. Periodic fasting and things like that? Yeah. In fact I just started one. I am on day one. All I’m having are green smoothies for three days. Sometimes I’ll go no food at all. I do that from time to time. It makes me feel fantastic. It gives my digestive system a break and allows it to cleanse and heal and all that stuff. It’s fantastic. More than that, there’s also a portion control issue. Adam, let’s say you and I go hunting 200,000 years ago and we score ourselves a mammoth. We’re not going to eat a tiny little bit of mammoth and move on. We’re going to eat as much as we can fit in. We’re going to gorge ourselves and so our stomachs will stretch at that point. Conversely, in the fall time when there’s a lot of fruit-bearing trees around, then we would not go over and eat one or two pieces of fruit and move on. Our body would be driven to eat as much of that food as possible and our stomach would expand the capacity to make that possible. The trouble is now is that most people’s stomachs seem permanently stretched. They’re not but they feel permanently stretched. Between meals that empty stomach feeling is even more painful and more powerful so they end up eating just to fix that. There are some other psychological issues which are more complex to describe but think of it in another way like Pavlov’s dogs. Because we feel hungry while our stomach is empty, we soon link our empty stomach to being hungry. They’re not the same thing. People often are eating memories. She suddenly got it that icing was her way of re-linking to the fondness and connection of her time with her mother. It didn’t matter that it was horribly bad for her pancreas and bad for her health in general. At that moment, it was about the connection she was getting. Once she realized that, it gave her freedom. She now realizes that it’s a lie and she doesn’t do it anymore. This emotional hunger is a big deal, again, because the food industry knows, say for example somebody’s overweight, if we can get them to feel shame about being overweight, then they will need to eat something to distract themselves from the shame. It’s the perfect marketing move. Emotional hunger is a big one that we need to manage. The other, low blood sugar hunger and a variety, they have their place as well. At the end of the day, most people have trained their nervous systems, their metabolism to burn sugar when really they should be metabolizing fat for a longer, more pervasive, long-lasting energy than sugar provides, and then they wouldn’t have low blood sugar. These $5 energy drinks, that’s just amazing. I read the other day that a teenager died from drinking energy drinks because he drank too many drinks in a short period of time. How about running a metabolism that doesn’t require artificial boosts of energy? I haven’t had coffee. I haven’t had caffeine since I was eighteen years old. Adam, you know me quite well, can you imagine me on coffee? No. You’re going to have to construct some new pyramids or something, in that magnitude. I’m hoping people from here will increase their consciousness a little bit here and start to take a look and go, “Why am I eating right now? What is really driving the decision?” Once you get what might be driving the decision that you’re dehydrated for example or there’s an emotional void. I saw this viral video, Adam, and it was so beautiful. It was a viral video where somebody had gone out and purchased all kinds of CCTV footage of people doing random acts of kindness. A street camera caught a picture of a guy picking up a person’s wallet that just dropped and then he was returning it. These two young men helped this lady across the street in the Ukraine somewhere in the middle of a blizzard. You just see these beautiful acts of kindness that at the time with the politics being the way they are in the world right now, with the environment thing, it’s easy to be a little pessimistic about humanity. Then this video comes along and you start feeling love and joy and amazingness about humans, and then Coca-Cola. They were the sponsor. They went and did it and they got you and they know why. Feel good, feel good, feel good. See the logo, see the logo, see the logo. Pretty soon when you’re feeling bad, you shortcut the process by drinking the logo. It’s an emotional link. I remember that from when I was a kid. We’re about the same age, I think. We’re not singling out Coca Cola obviously. They’re just the best at it. They were great at it. If we could single them out, they’re best in class. Remember the big circle with the candles. What was the song they would sing? “I’d like to buy the world a Coke and sprinkle it with love,” or something. Whatever it was, it was such a kumbaya thing. Then they basically invented Santa Claus and that gorgeous polar bear. In the Coke and Pepsi battle, this is really interesting when you think of food psychology. There’s this impression that Pepsi is number two to Coke, which it is. The impression is that they’re quite close; they’re not. As I understand it, Coke outsells Pepsi four or five to one. Number two is so far away from being number one, it’s not funny. Consider what did Pepsi do? Pepsi tried more traditional like, “We’re going to link up a celebrity to this and we’d do a “Taste of a new generation.” All Coke has ever done is sought to make you feel good while you see their logo. It’s all they’ve ever done. To this day, and let me be clear, I hate the product unless for cleaning toilets and blood off sidewalks. When I’m traveling around Africa, and as you know I spend a lot of time in quite remote Africa, the weirdest thing is you see the Coke sign everywhere. I have this bizarre reaction when I look at it. I have fondness like they’ve hypnotized me. We have to recognize that the food industry is spending and they’ve hired incredible people. The tobacco industry did the same thing. They went out and hired a guy whose work was used by the Nazis to create crowd manipulation. Then the tobacco industry hired this guy to get women to smoke because they wouldn’t smoke. It was fascinating. How did they do it? The same way the food industry does it today, they did market research. They found out that women didn’t smoke because it was dirty and smelly, and as a rule women, don’t really like dirty and smelly. What they did is they said, “What’s important to women right now?” They said the suffrage movement, independence, the vote, all that stuff is really important to women right now. This guy just said, “No problem. If you can tie cigarettes to that movement, if you can tie cigarettes to their hope for independence and their hope for equality, they will start smoking.” The next thing you know, “You’ve come a long way, baby.” Women start smoking. They know how to manipulate us. We have to learn how to un-manipulate. Speaking of that, and I don’t want to go down this rabbit hole too far but just a little bit, we were talking about some of the movies that are out there, some of the things that people find on Netflix and elsewhere. The two that we talked about was Cowspiracy and What the Health. I think there’s a problem when there’s misinformation that’s being perpetuated and goes viral. In the interest of arming the consumer or taking care of the consumer, and yet embedded in that information that’s supposed to be consumer-oriented, there’s misinformation for other agendas. Can you speak to that in a neutral way? Is that possible because I know you’re pretty passionate about it? In my business life, I’m extremely well-known as a communications expert. I’ve trained some of the top speakers in the world to be able to get on stage and do what I’ve been doing on stage. I’m very good at the psychology aspect of it, and so I understand marketing and I understand this communication thing. One of the things that we have to get, one of the features that we have to understand is that when you’re making an argument, what you want to do is make an argument that can be built on a position of strength. What we saw for example in Brexit in the United Kingdom was that both sides of the campaign were lying constantly. They were both using fear and lies to manipulate the audience, to manipulate the potential voters. The problem is that once you start lying, you lose credibility for even the things you’re saying that are true. There are very serious issues with the way that EU is governed, but there are also really serious advantages to the world, to the region, and to the United Kingdom for staying in. The problem is once everybody started lying, nobody could hear those things anymore. Once you start lying, you lose credibility for even the things you’re saying that are true. Without naming any particular movies that you may have named earlier that sometimes branch out into the realm of propaganda, what they’re doing is they’re often taking some things that are very true. The way we produce meat in the Western world, frankly in the world, is deplorable. If aliens ever come down here, we’re going to get convicted for the way we treat animals. It is disgusting. These movies show some of those things and they’re very good arguments. Then they use dishonesty in many of the other messages they share. There was another movie which I won’t name that I frankly very much liked. It was vegan propaganda but I very much liked it except for one problem is they then tried to create a relationship between meat and cancer development. Remember, the word meat means all meat, which means that you’re now talking about badly produced hormone-injected, grain-fed, unethically-raised meat, and free range meat as though they’re the same thing. They’re not. Now when you vilify meat as a topic, you create a problem. The second part of this is in that movie, they showed this slide and it showed that as the population of any given country was eating more meat, they tested for higher levels of cancer cells. Then they flipped off the screen. If you watched that movie and rewound it and put that slide back up, what you’ll see is that the graph also showed that as people’s meat intake went down, their cancer cell production went down. Do you really think that 200,000 years ago, you and I as hunters would have been lucky enough every single day to get meat? Of course not. First of all, we would never have been that lucky. Secondly, we wouldn’t have desired it everyday. If you’ve had the same meal three days in a row, aren’t you looking for some variety? There’s going to come a point where like, “Adam, I’ve had quite enough mammoth. Thanks very much. I really want something else.” There would have been natural seasonal ebbs and flows in our protein intake which would have caused natural ebbs and flows in our cancer cell production. Like with bone density, our bones are designed as banks for calcium. When we eat a diet that’s very acidic, our bodies borrow calcium from the bones to deal with that acidity. When we eat a diet that’s extremely basic or I should say alkaline, what happens is we repay the loan to the bones. These movies unfortunately take half of the argument to make a particular manipulative statement. It would be very much like this, Adam. You and I could go out and produce a very convincing movie right now on why eating poop is a bad idea, because it is unless you’re a dung beetle. If we could go out and convince dung beetles all over the world that they shouldn’t eat poop because it’s gross and it’s smelly and it’s full of bacteria, and frankly it’s an invasion of privacy, you don’t want somebody eating your poop, “Don’t eat poop anymore.” We could produce a very convincing movie about how bad poop is. But the problem is that dung beetles evolved the requirement for it. If they chose to stop it because of our propaganda movie, they would end up with malnutrition and then their species would come to an end. Is moderation what we’re talking about? We’re just talking about moderation here where when you remove some of these headlines that are grabbing people’s attention that really what we’re saying is meat in moderation. Eat proper. If you’re getting grass-fed good meat, something that’s been ethically raised where there’s a lack of hormones and things like that, that in moderation is okay? Yeah. We have an expression in WildFit that everything in moderation includes moderate health. As a rule, the ‘everything in moderation’ rule is one of the biggest myths of the diet industry. Everything in moderation is a path to cancer, heart disease, diabetes, and a plethora of other diseases. Used in the context that you’ve just said, yes, you’re right. First Principle of Business: Everything in moderation includes moderate health. Smoking cigarettes in moderation is not a good idea, right? Yeah, in a way. There’s this issue of what is moderation. For some people moderation is one or two glasses of wine everyday. Your liver doesn’t think so. Your liver does not see that as moderation. They see that as extreme behavior. We think of extreme behavior as like getting really, really drunk. No. Having a glass of wine everyday, that’s extreme behavior. I think the issue is what is moderation? In the case of meat eating, for example. The human requirement for meat is very much open to debate. What is not open to debate is that humans have been meat eaters forever. Our closest cousins on Earth are meat eaters as well. This doesn’t mean that somebody has to go and eat meat everyday or even every month. There are significant markers that suggest that some of the nutrients that we get from meat stay in our system for months after we eat meat. You and I will go get ourselves a mammoth, we bring some meat back, Elise, Randi, and the kids get to have some meat, but then we’re not so lucky hunting for the next several weeks. That’s fine. That’s okay. I was completely vegan for four months eighteen months ago. I just felt like it. I just wanted to. It felt great, by the way. When I’m in full workout mode, I go out kiteboarding out here for four hours. I come back and I’m looking for a piece of meat. I get the best thing that I can. Could you share a little bit about the WildFit program? From my understanding of it, it brought us back to a place you call spring. It put us into ketosis. It brought our bodies back to a more alkaline state. Could you sum that up and why? It’s funny that you mention ketosis. We’ve been running this program for years and we never even told our clients about ketosis. We just ran them through the program. As ketosis became this buzzword, our clients go, “Are we in ketosis now?” “Okay, yes.” There are a couple of things to think about. Tim Ferriss talks quite a lot about ketogenic living and that sort of stuff. I remember hearing in his podcast once, he said that less than 10% of people who attempt the ketogenic diet will actually succeed because it’s really difficult. What I will remind you of is that we do move people into a season that we metaphorically call Spring in the WildFit program, which is a ketogenic season. We run with a 90% success rate. There are some things that we do that people can apply right here without ever doing our program. They certainly can come and do it one day and experience it with us. One of the things that we do is a very staged process where we work on the food psychology, then we work on adding the right nutrition, and then we work on subtracting some of the things that would take us out of the ketogenic state. By doing that in a staged way, we make the whole process gentler. People then enter into a ketogenic state without pain. They get there feeling good about it. They might find a little bit of boredom because it’s a new eating pattern and they haven’t quite learned how to do it yet, but they get there and they get the benefit of it. An important thing to remember here is we talked a little bit before about seasons. Ketosis is not a lifestyle. We were not designed to live permanently in ketosis any more than we were designed to live permanently in sugar metabolism. These are seasons. This is a very core principle of WildFit and I suspect that you’ll begin to see it as a core principle of any successful diet program in the world because it’s just correct. Our species evolved to go through cyclical dietary change. It is healthy for the body to go into a ketogenic state for a period of time, and then to come out of that ketogenic state for another period of time. That’s a normal process. In WildFit, we do that so beautifully and so gently that people learn how to do it for themselves. If folks wanted to find out more about the program, see if it’s a good fit for them at this point because it’s a commitment. I’ll say that right upfront and I think it’s a more than worthwhile commitment. In fact, I think it’s a freaking life-changing commitment, but you’ve got to make a commitment to it. That commitment is in essence 90 days. You don’t do it for shorter periods. It’s three months and it’s remarkable. It’s not easy necessarily. I think in being in the group some people had a harder time with it and others had an easier time with it. It hit people in different places. The psychology was probably the biggest thing for a number of folks. I know I learned a great deal when I paid a lot of attention to why I was eating. That’s one of those things that I hadn’t thought about before, “Why am I eating this? Why am I putting this in my mouth? How do I feel after I eat it?” All that stuff. Adding some things that I had never had added to my diet on purpose and then subtracting things again in a purposeful way, in a conscious way. I thought this was great to have you on as part of The Conscious PIVOT because it’s not just about changing things, it’s about making a conscious decision to change things. Hopefully with good information, and not changing based on being the subject to someone else’s propaganda or based on scarcity or fear or worse yet that it’s in response to illness that’s shown up because you’ve neglected yourself or been misinformed for too many years. Hopefully this will hit people, land well with folks and they’ll be curious enough to want to go seek it out from you. Let’s not make it too difficult for them, Eric, to find you or find information about the WildFit program. For everybody here, GetWildFit.com. There’s a video-only version, that’s the lowest cost way to do it. You can do it anytime you want, do it on your own. Then you can do it in small classes where there’s a small group of people that go through it together as a challenge. We occasionally have this big class challenges that might have several hundred people all going through it together. There’s also private one-on-one with our coaches as well. There are a number of ways people can do it depending on their lifestyle and their learning model. Basically the way the program works is, it’s 90 days. There are pre-recorded videos that they consume. In the first week, there are daily videos. After that, there are videos twice a week. Then a bunch of bonus content on specific types of food or specific behavioral change. If they’re in a coaching environment, there’s live coaching sessions with their coach and their team. The entire process runs through this very gentle 90-day cycle. There are some things that are new to it since you went through. There is now a thirteenth week so it actually goes beyond three months. The thirteenth week is called Living WildFit. It’s all about how to take WildFit off into your future. It’s back to daily videos and it’s really immersive. We also give them, as a graduate of our program, a free copy of the book Living WildFit as a guide for maintaining the lifestyle. Since you did the program, we did something really cool and that is we collected all the questions we’ve had for three or four years and tagged them based on the week that the person asked them. We now know all of the questions from week one, all the questions from week two, and then we recreated the entire program and added in all the extra information that needed to be there. The 2.0 version of the program, as successful as it was the first time, it’s even better now. Much better to meet them where they are. That’s the best way to know, be in that constant feedback loop. If you’ve got a handful of key people who would love to do this, I’d love to do maybe a private class for Pivot where we can take a handful of people and run them through it. If you think about it, what a great way to introduce it to your whole tribe. People who are pivoting, and they know who they are, they’re listening to this podcast but they’re also out there working their life. Pivoting is not an easy thing. Seriously, to change career or to change job or to be an entrepreneur, which I think is the most exciting thing you could be doing these days. It is like waking up in the morning, getting your daily abuse, and loving it so much you get up in the morning the next day loving your life and still ready to get up and take a sock in the head. In furtherance of the freedom that you’re looking for and the way to serve the world, you’ve got to be strong for that. You’ve got to have energy, physically be strong, mentally be capable and strong and agile and resilient. Resilience is the key. To me this is a resilience tool. It’s part of that ritual that you take care of yourself better. First Principle of Business: Freedom, it’s about living the way you really want to live and not living the way food manufacturers want you to live. You said something that I think is really important to mention, and that is that one of my highest values as a human being is freedom. I really like personal liberty and freedom. Often people give up. There are so many people that have never done a diet or given up on diets because they value freedom so much, and the concept of calorie restriction or being hungry are frightening to them. We don’t do any of that stuff. Nobody’s ever hungry on the program. Nobody does calorie counting. The neatest example of this for me was when a business client of mine came to me and he goes, “I’m thinking about getting WildFit but I don’t think I can because I really value my freedom.” I said, “What do you mean?” He goes, “I love being able to eat what I want, when I want, whenever I want.” I said, “Can you not?” He’s like, “What do you mean?” I go, “Can you not eat what you don’t want?” He goes, “I don’t understand.” I go, “You have a thing with pizza. If there’s a pizza here, would you eat it?” He goes, “Yeah.” I go, “But we just had lunch.” He goes, “Yeah, but it’s pizza.” I said, “In other words, you have no freedom not to eat the pizza.” He went, “Oh.” He realized he actually didn’t have any freedom at all. He had the illusion of freedom bought and paid for by the food industry, and what we gave him back is his freedom. He has since lost about 30 kilograms or 50 pounds and completely turned his life around. That point you made is about freedom. It’s about living the way you really want to live and not living the way food manufacturers want you to live. This is a lifestyle choice. Eric, I love you. Thank you for making the time. Great to hear you. I’m most happy that our PIVOT community gets to learn from you and experience what you’re doing. Thanks very much for having me. Thanks again for listening. I hope you’ll share this podcast and comment on it. I’d love to hear your comments, your questions, and topics of interest for upcoming podcasts. Don’t forget to subscribe to the channel, follow us on social media, if you haven’t already. Ciao for now.